I’m so excited to participate in my first ever blogger linkup! 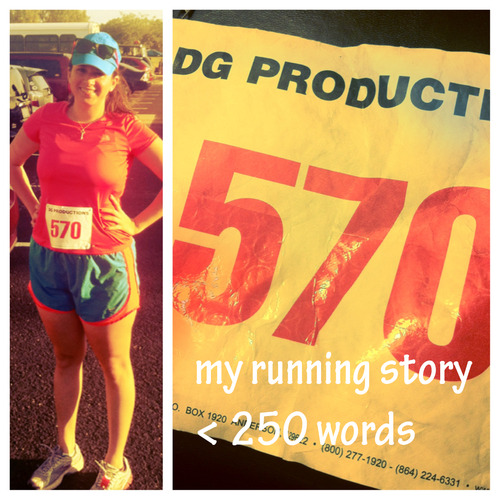 Here’s the story of how I began running in 250 words. I totally bandit-ed my first race. I now know that’s an incredible runner sin, and I am super sorry. My best friend invited me to run in a 5k with her and her family a week before Christmas 2011. I had never entertained the idea of running, but I wanted to hang out with Nikki, so I said I would be there. I ran a mile and a half the night before, just to see if I could. It took me 39 minutes to jog/ run/ walk my way through the Dallas Design District. But I was hooked. Cut to New Year’s Eve 2011. I decided to really take the plunge. I made it my New Year’s Resolution to run a mile every day during 2012 (or an equivalent number of miles). 365 miles in one year. That was the first resolution I’ve ever kept. In 2012, I made the 5k my race. My first real, I-paid-money-for-this 5k took place in approximately 19 degree temperatures. I made a dorky tutu and tromped all over OU’s campus gleefully, knocking 3 minutes off my first race’s time. I can now run a 5k in less than 30 minutes without killing myself. I’m two half marathons into what I hope will be a lifelong love affair with running. Like I’ve said before, running makes me feel strong. I am so blessed to have a hobby that lets me do things I never thought I was capable of.